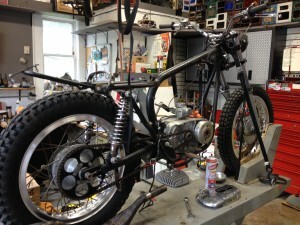 1967 was the first year OSSA was imported to the States. They are somewhat rare – about 200 Pioneers were produced in Spain. I never thought I’d own one but, thanks to Dean DiCarlo, I now do! Dean has a great collection of 4-speeds. He acquired this one, did a lot of cleaning, bought some parts from Hogan’s, repaired and sealed the tank – but decided to pass it on to me to finish the restoration. I painted the tail section and fender, re-chromed parts, mounted the correct tires and restored the suspension. It also needed a piston/cylinder and Motoplat, which Al Snoop supplied! Now it runs! The 67’s fuel tank has a unique shape, side stand has an “internal” spring, rear frame is shorter with a bolt-on support for the tail. It also came with a 19” front wheel and trials-style tires. It looks pretty good now. I will restore the wheels at a later date. The frame paint is original – I think I’ll leave that as is!